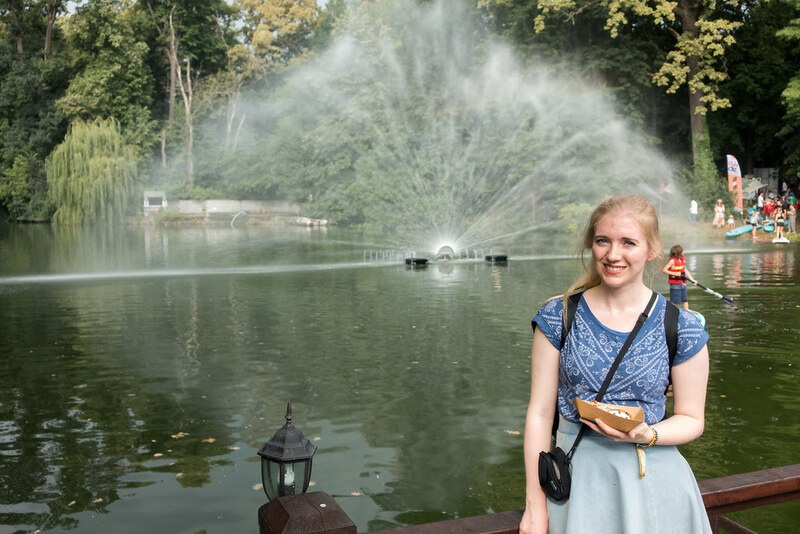 Post 1 of a series detailing our Eastern Europe road trip. View all the posts so far here. 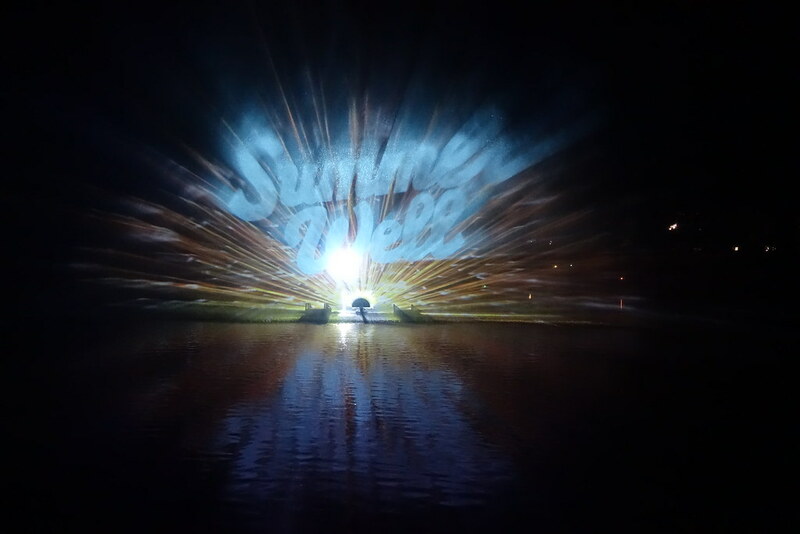 It’s rare that a music festival combines lots of bands I like with an affordable price tag, so I was thrilled to come across Summer Well Festival. Offering Interpol, Metronomy, Glass Animals, Editors and Roosevelt for around £60 a ticket, it was a dream line-up for my difficult-to-define music taste. 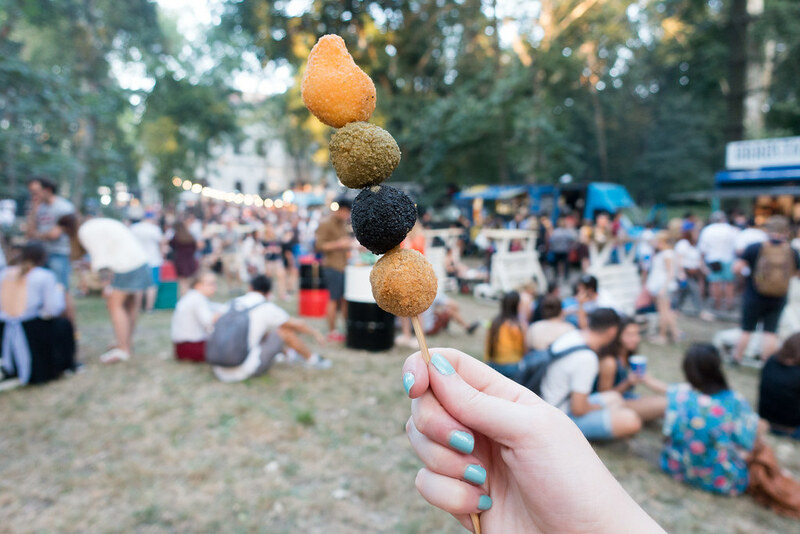 The fact that this annual, weekend-long festival is held just outside Bucharest, Romania, made it a little more challenging to do than a UK festival – but it also meant a better chance of good weather. After deliberating over it for a couple of weeks, my boyfriend Steve and I eventually decided to go the whole hog and use Summer Well 2017 as the starting point for a mammoth, month-long road-trip around Romania, Serbia and Bulgaria. As returning readers of this blog will know already, when it comes to holidays we don’t do things by halves! The festival was due to run over Saturday and Sunday, 12 to 13 August, but we learnt closer to the time that it would begin on Friday 11 with an event called the ‘night picnic’. 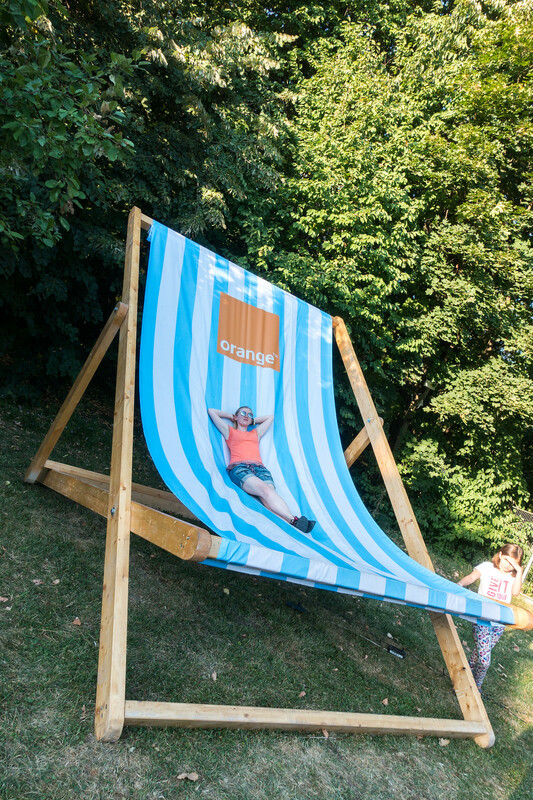 We headed there early – straight after picking up our festival wristbands from the Orange shop on Piata Victoriei – so as to have time to explore the site, decide what to have for our ‘picnic’, and stake out a good spot on the grass. 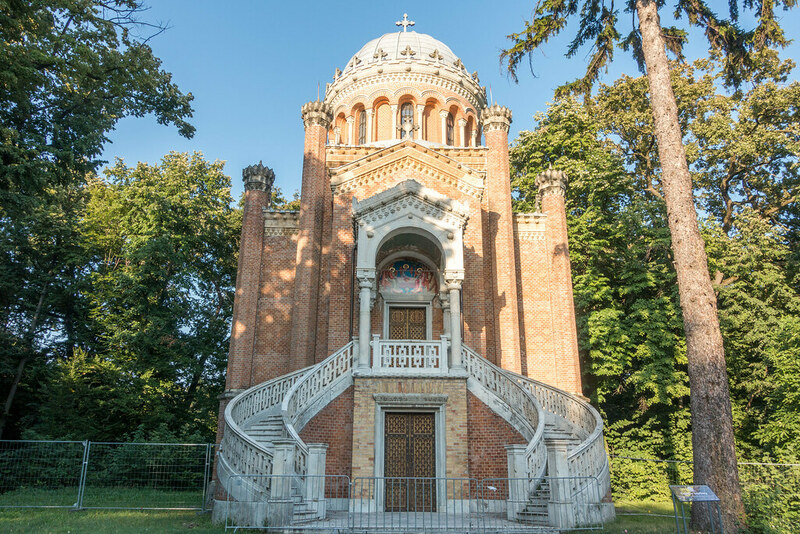 Summer Well is held at Domeniul Stirbey park in Buftea, which lies just outside the Romanian capital of Bucharest. 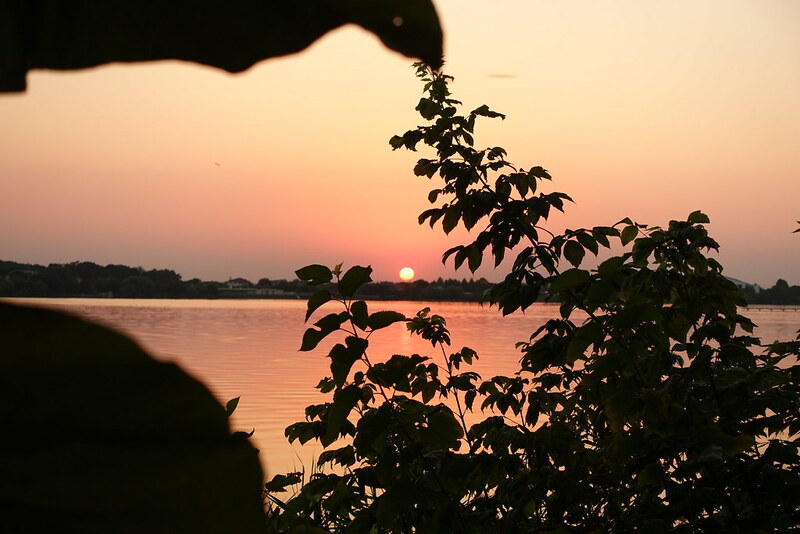 The wooded park serves as a beautiful and peaceful festival ground, offering quiet forest paths to walk and a large lake to sit beside (or paddle-board on!). 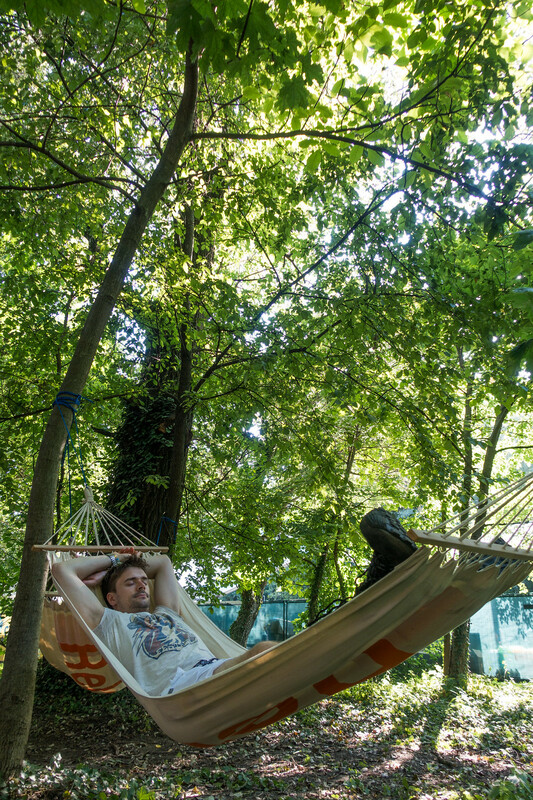 The park was decorated in a colourful and whimsical fashion for the festival, with hammocks hung between trees, neon signs illuminating the leaves, and fairy lights everywhere. There was a giant art installation opposite the stage, and a cinema area featuring a blow-up screen and giant deck chairs. 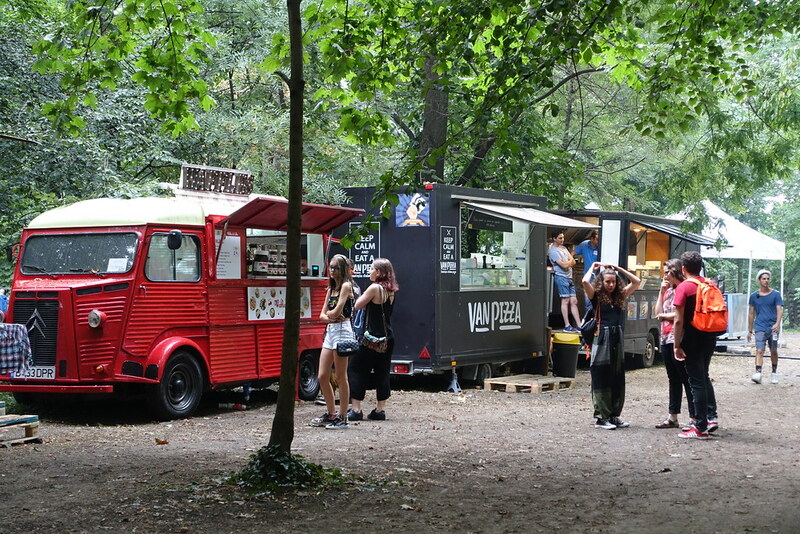 Sponsored tents offered activities, free temporary tattoos and themed chill-out areas, while rows of stalls sold a wide variety of international street food. In our initial exploration of the site, we played with a selfie tablet and I got myself a temporary tattoo of some blue stars. We managed to catch an amazing sunset with a huge ‘African sun’ at the sunset lookout point before deciding to go and buy dinner. 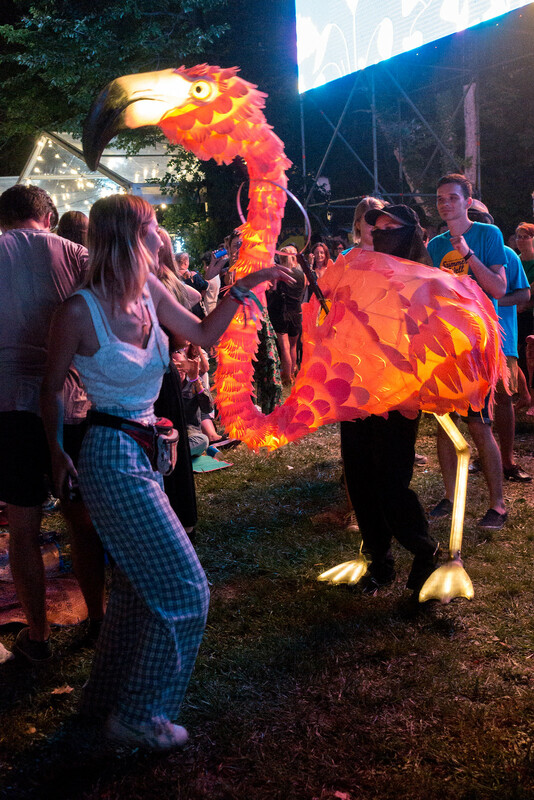 Once it was dark, a parade of tall, glowing ‘flamingos’ built from tissue paper began to stalk around the site, and to dance with festival-goers. 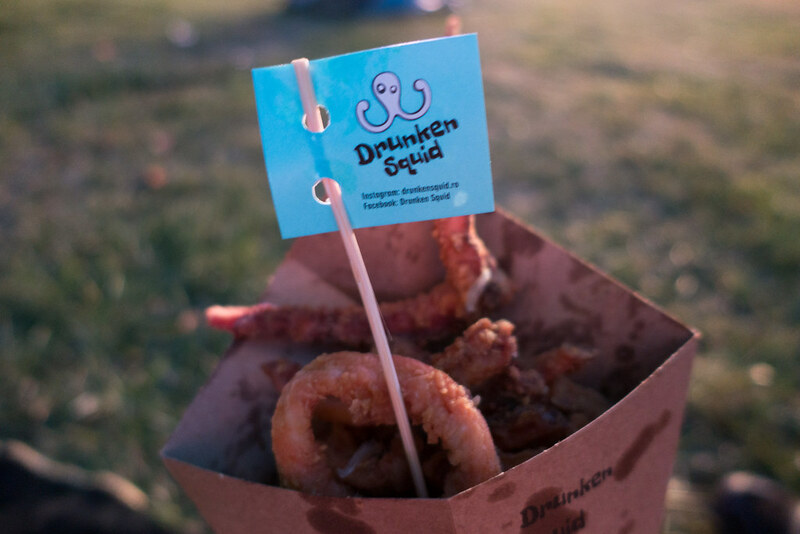 My picnic was a glass of wine and a paper cone of calamari from the Drunken Squid stand, while Steve went for a burrito. 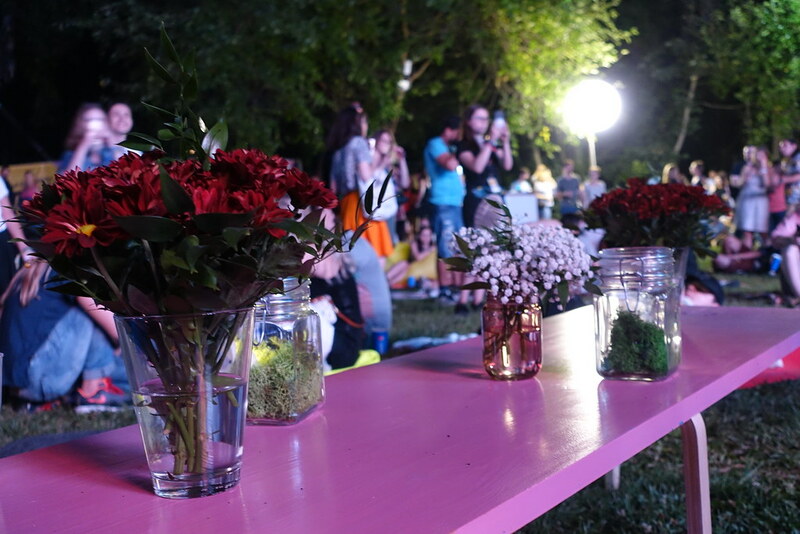 Further back from the stage there were long pink tables laid out with vases of flowers, for people to sit at and enjoy their food. But we wanted to be closer to the stage, so went closer and lay our blanket out on the grass. 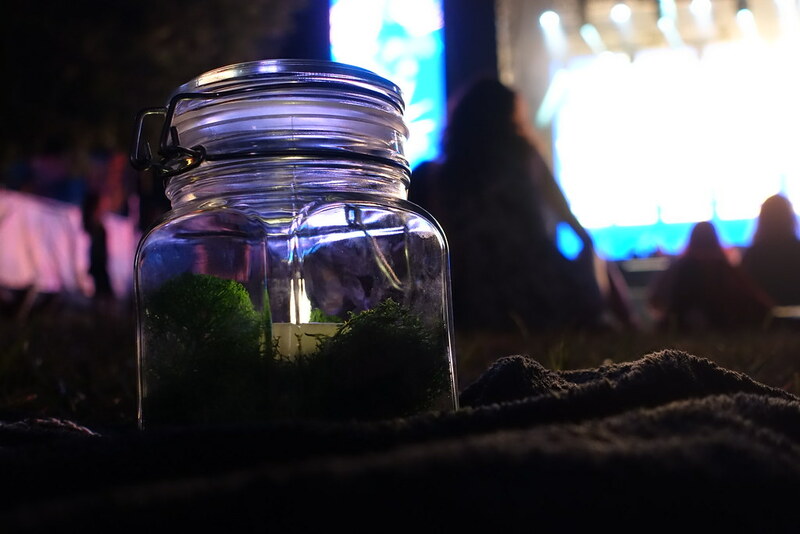 As we waited for the music to begin, stewards walked round placing jars containing electric tealights on the ground. 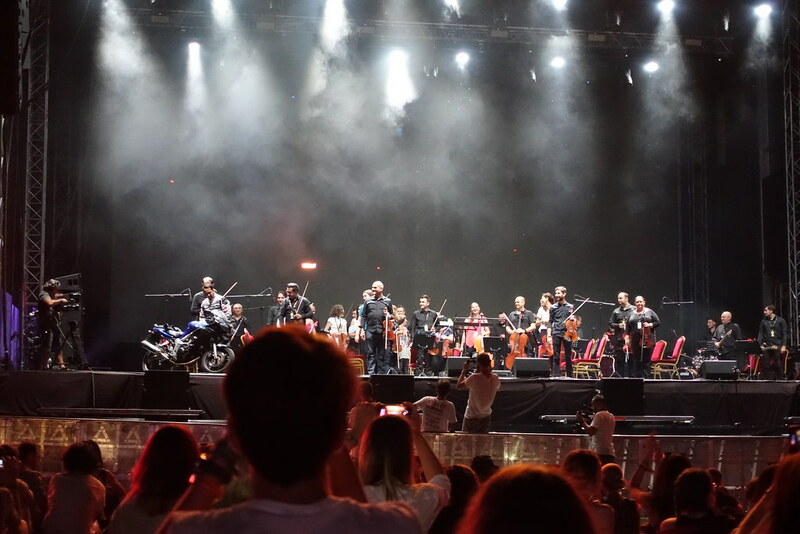 Finally, the Bucharest Symphony Orchestra took to the stage and blew us all away. 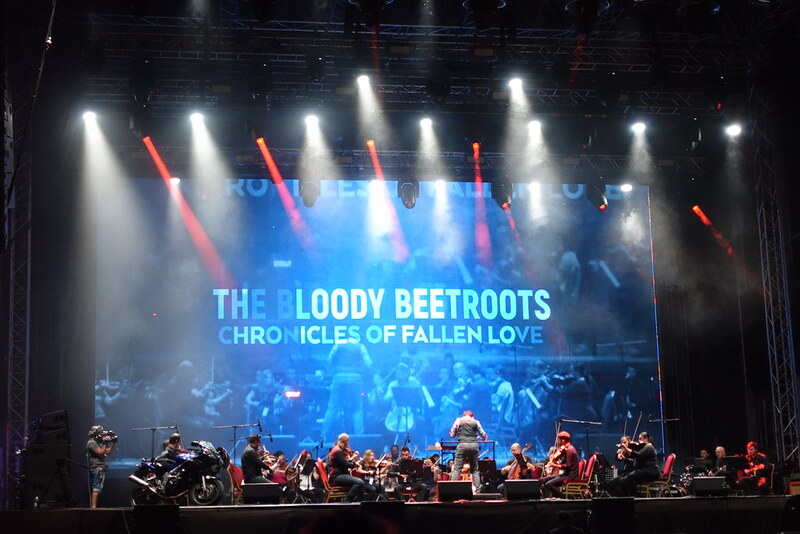 Beginning with a spectacular orchestral reimagining of the Chronicles of a Fallen Love by the Bloody Beetroots, the orchestra went on to play one song by each of the bands playing at the festival, including The Look by Metronomy, Fever by Roosevelt, All the Kings by Editors, Doing it to Death by The Kills, and Amsterdam by Nothing but Thieves. Coloured lights and minimal imagery flashed along to the music, which sounded just incredible. Steve and I agreed that it was one of the best things we’d ever seen. The following day, we got the (very crowded) 4.30pm bus to the festival. Straight away I bought a mojito from the Bacardi Bar, Steve got a beer (which unlike spirits, was available from almost every bar) and we relaxed on shady hammocks while we waited for the music to start. 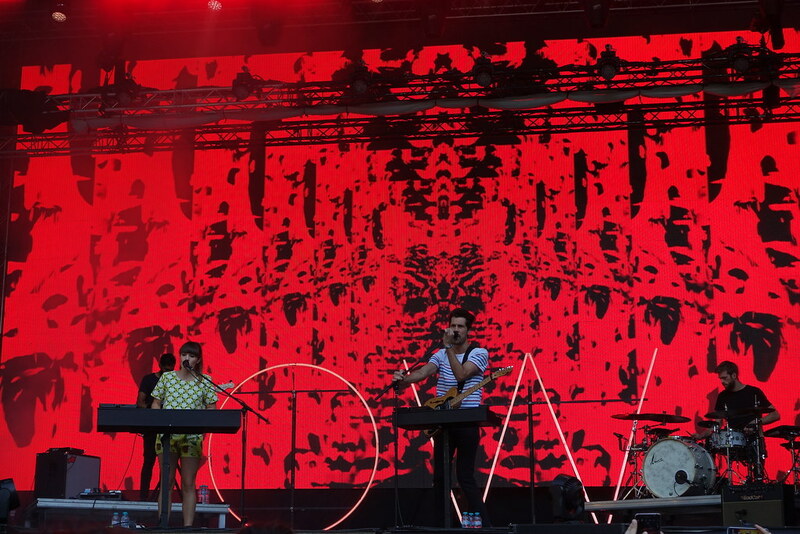 Indie pop duo Oh Wonder were up first, and although I’m not a fan I enjoyed watching them perform. Singer and keyboardist Josephine was super enthusiastic and seemed really happy to be there, and the young, glittery crowd (we were definitely in the older age bracket) clearly shared her excitement. Afterwards we went to get food: arancini from Italian street food purveyors Arosticini for me, and a pulled pork bbq bun from Meatbusters for Steve. Finding the choice of non-beer drinks limited, I resorted to Bacardi Breezers and found the red watermelon one to be the nicest. 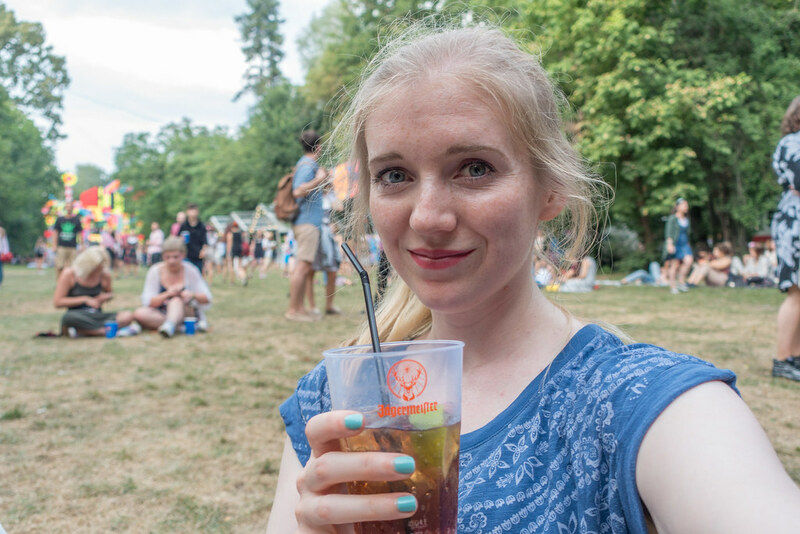 We went to watch some of Horne and The Kills’ performances, but found them a bit boring, so instead spent some time chilling on beanbags in the forest. 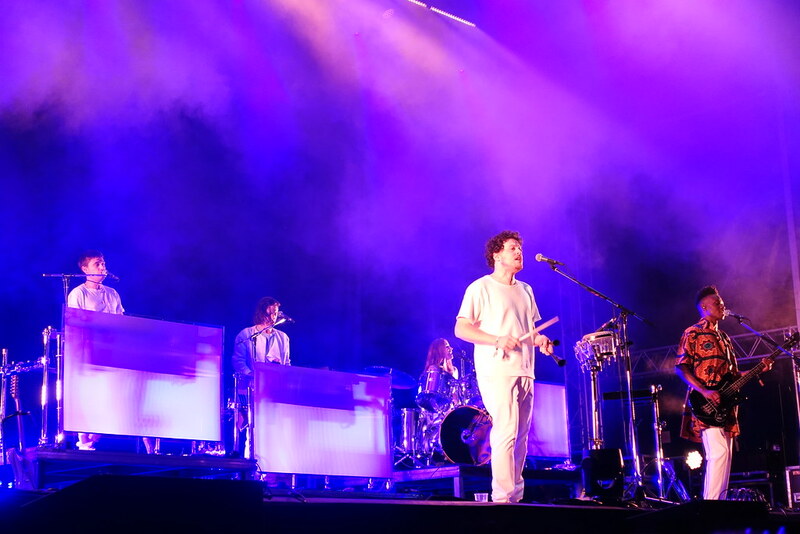 With not long to go before Metronomy – one of my favourite bands – took to the stage, we went to buy drinks. Unfortunately, the queue for wine was so long that I had no choice but to spend a great deal more on champagne from the much quieter champagne bar! The inconvenience was soon forgotten when we managed to secure a spot near the front of the stage just in time for Metronomy. The band put on an amazing show, enhanced by clever lighting tricks and inventive instrumentation, and we had a great view throughout. I had the time of my life dancing and singing along! When Metronomy left, we stayed where we were for Interpol. 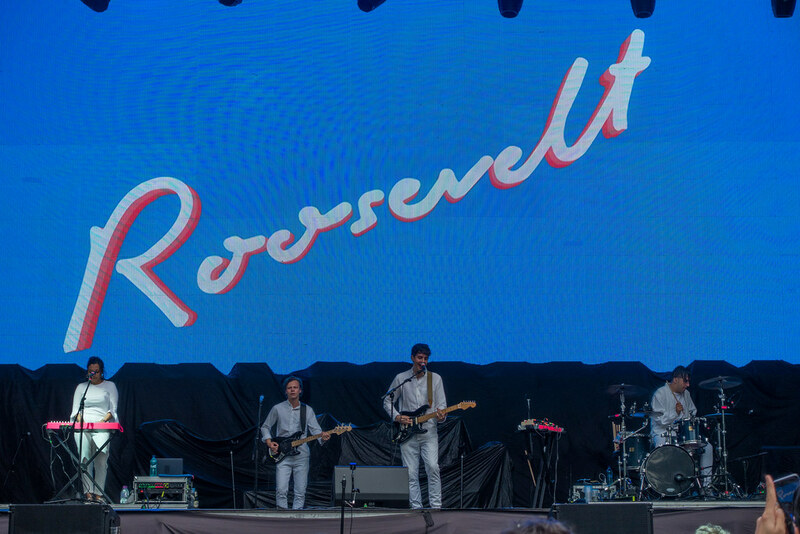 Although they have always been one of my favourite bands – and I thought they’d be my highlight of the festival – after Metronomy, Interpol’s set seemed too long and lacking in fun. 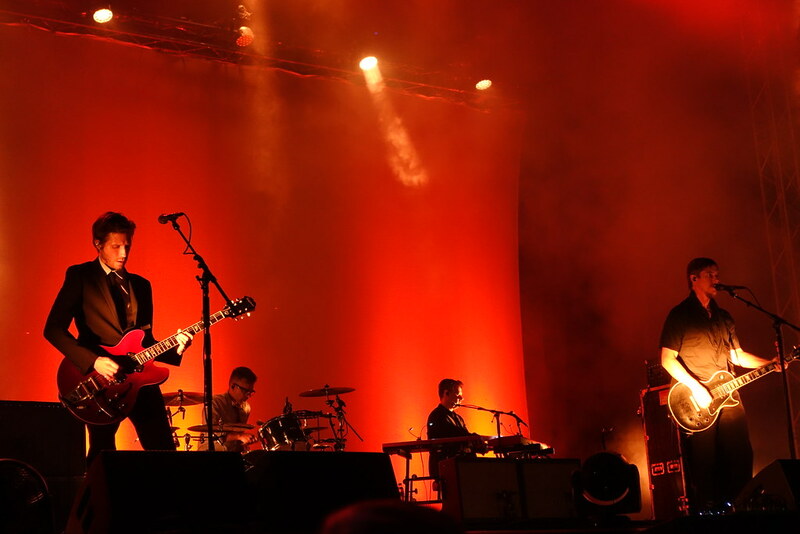 They began by playing a standard-length set of songs old and new, but then went on to play Turn on the Bright Lights – their first album and my favourite – in its entirety. In theory this should have been brilliant, but unfortunately I felt that many of the songs were just not suited to a festival setting. I see these songs as music to lose yourself in, alone, in a dark room – not to be clapped along to en-masse. Once they (finally!) left, we went to the ‘cinema area’ to sit on the grass and watch the end of Batman v Superman before catching the bus home. Compared to the sweltering heat of the past two days, the final day of the festival was cooler and cloudier. We caught the bus in at 1.30pm and bought lunch when we arrived. 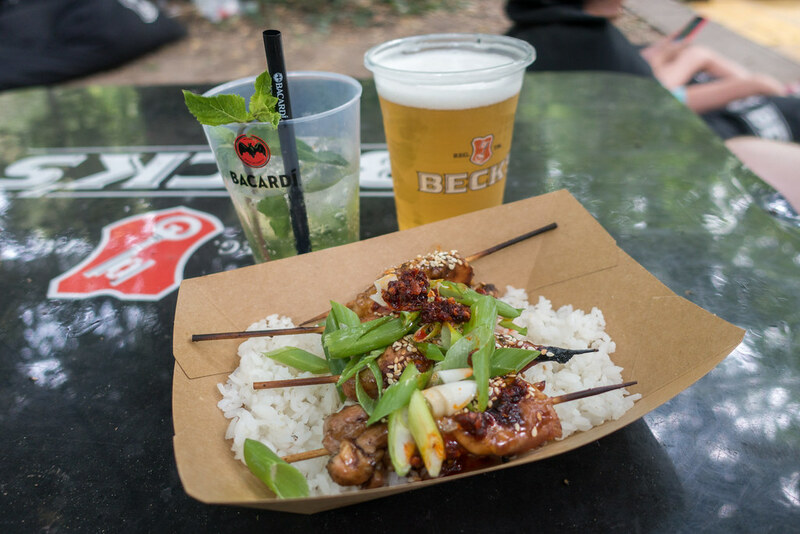 I bought some delicious Japanese chicken yakitori – sweet sticky skewers served with sticky rice – from Nori Yakitori, while Steve went for a New York hot dog with cheese and chips from Fugurola. It began to rain as soon as we’d made our purchases, but fortunately we found some free beanbags under the shelter of a bar. These made for a very comfortable spot in which to enjoy our food and wait out the shower. As soon as the rain subsided, we made a beeline for the zip line. 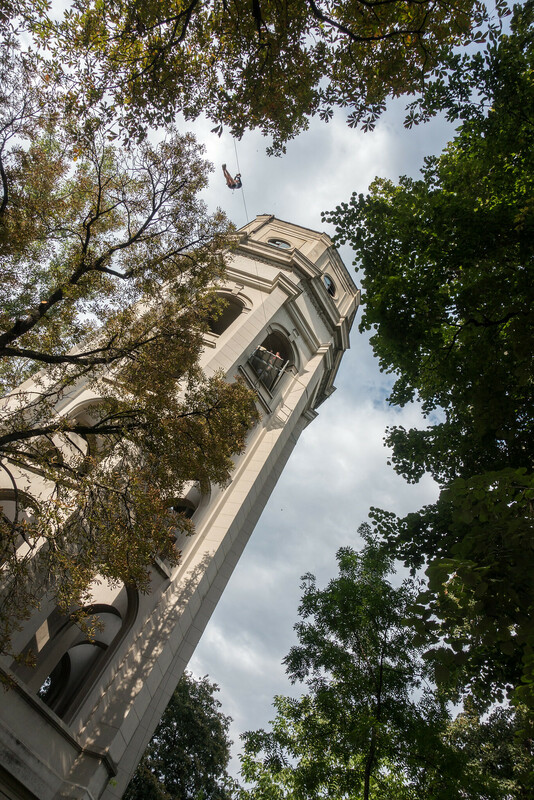 Standing quite hidden away among the leafy trees, the line began from the top of a tall stone tower. From there it flew across the treetops to a lower platform, before shooting back across the lake to the ground. 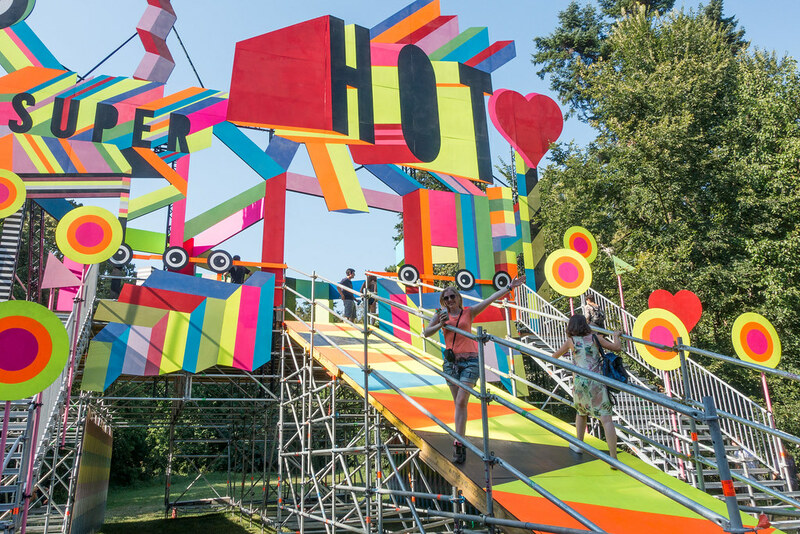 Despite having to sign an anxiety-inducing contract before we were allowed to climb the tall, winding staircase to the start of the line, the ride itself was not scary at all – just really fun, and very scenic too! The only hiccups arose from the safety instructors not realising we didn’t understand Romanian, but we got there in the end. Back on solid ground and craving something sweet, I ordered a vanilla cannoli from Mr Cannoli, which we followed with two Jaeger shots (this may seem an odd choice, but with Jaeger being a sponsor it was one of the very few drinks available!) 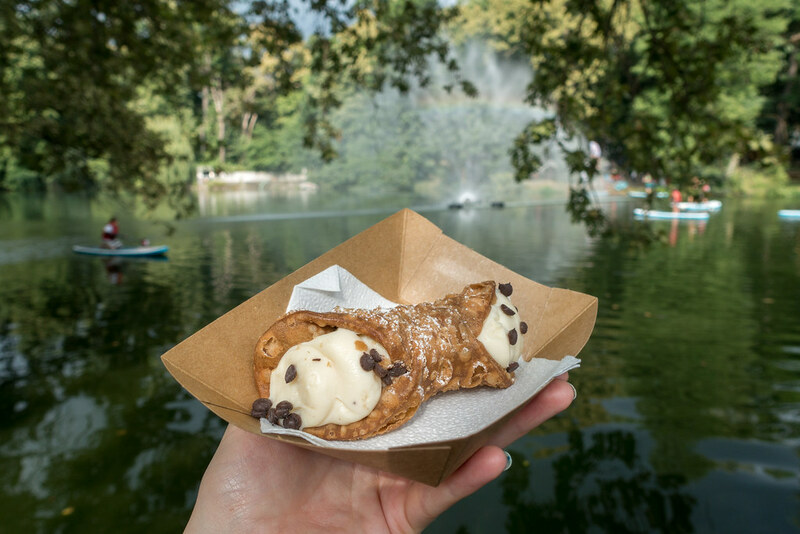 The cannoli looked so perfect that I couldn’t resist photographing it in front of the similarly beautiful forest lake that we’d just ziplined across. 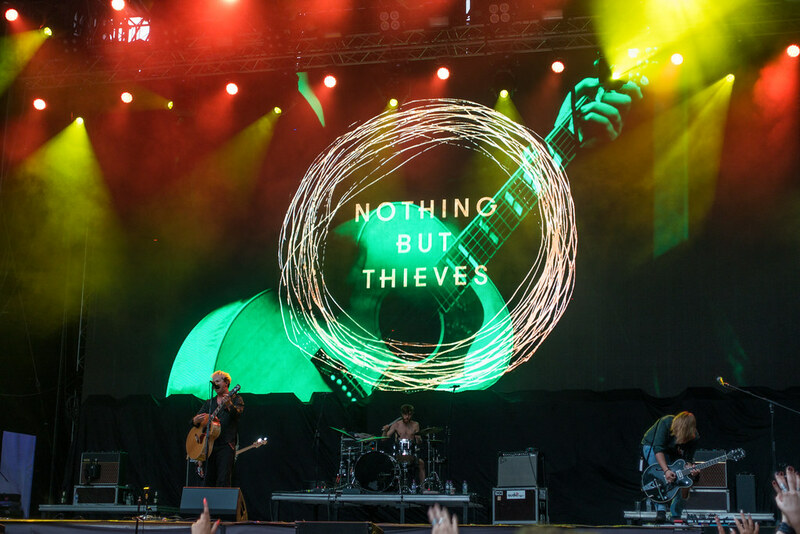 The first act of the day was Roosevelt, who played a fantastic chilled out set, followed by a lively set by Nothing But Thieves that got everyone shouting and jumping. Afterwards we got some more drinks and sat on beanbags by the lake, watching a few brave people giving paddle-boarding a try. When the sweet tones of Birdy drifted over to our ears we went to watch her for a bit, then moved closer to the stage in time for another favourite band of mine, Glass Animals. 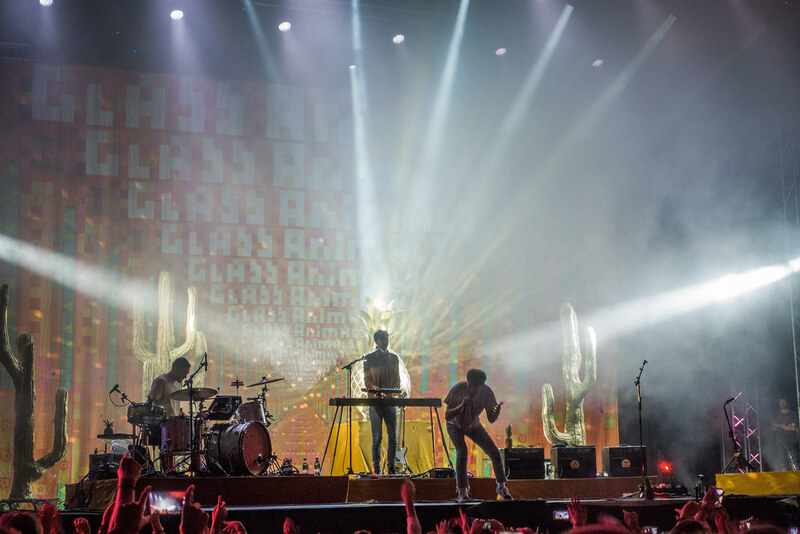 Glass Animals are fantastic live. Frontman Dave Bayley, in particular, brings incredible energy to the stage – and to the crowd, when he inevitably jumps in! This performance was just as fun and energetic as I’ve come to expect, and I joined the crowd in dancing and singing along with vigour. We went to find dinner before headliners Editors came on, hoping to get back in time for their set. Wanting to be quick, we accidentally bought an absolute ton of pizza from Latin Pizza in the Food Court (they used a confusing system in which differently sized pieces are cut from huge rounds, and the price is based on your serving’s overall weight). By the time we returned to the stage to watch Editors we were stuck further back, but we still really enjoyed their set. Despite only recognising a few songs, they put on such a good show that it didn’t really matter. Frontman Tom Smith gave an unexpectedly passionate performance, and the stage was decorated with giant industrial fans and a cool tunnel-effect backdrop which put me in mind of a Tomb Raider level. The huge flames that later burst out of the stage completed the spectacle. 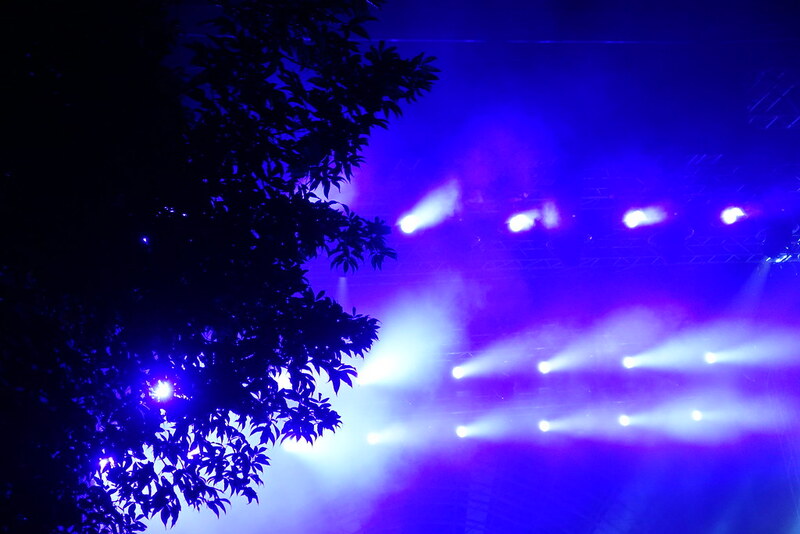 We were tempted to stay for the 1am ‘end show’ by Bloody Beetroots, but decided better of it – we were both very tired by then, and knew we had to pick up a rental car at 9am tomorrow. We must have timed it well, as we managed to get seats on the bus! Finally, some advice on Bucharest’s public transport for if you are planning to go to Summer Well Festival. We were two of the unfortunate people getting the shuttle bus to the festival each day. I say “unfortunate” because it was not the most comfortable of journeys: almost every bus we took was jam-packed and swelteringly hot, which made the 40-minute drive feel even longer than it was. You were hugely lucky if you managed to be at the front of the disorderly crush to get on the bus, and to get a seat. Provided by the local bus company, this had to be paid for via Bucharest’s rather confusing travel card system. Possibly due to the language barrier, buying what we thought were return tickets for both of us got us one card with two journeys on it, meaning it only got us both one way and we had to buy another ticket back. There’s also an additional fee for each paper ticket you buy, on top of the ‘journeys’. We learnt eventually that it was much better to buy one ‘non-subscription travel card’ between us and to load it with enough money to pay for all the journeys we had to take, for example, 8 journeys for 2 return trips for the 2 of us. These travel cards can be loaded up with more journeys at the sales kiosks beside certain bus stops, without the fee for a new piece of paper. However, if we do go to Summer Well festival again – which is a definite possibility – I’ll be looking at the on-site accommodation options so that I can spend as much time at the wonderful festival, and as little time on the bus, as possible! 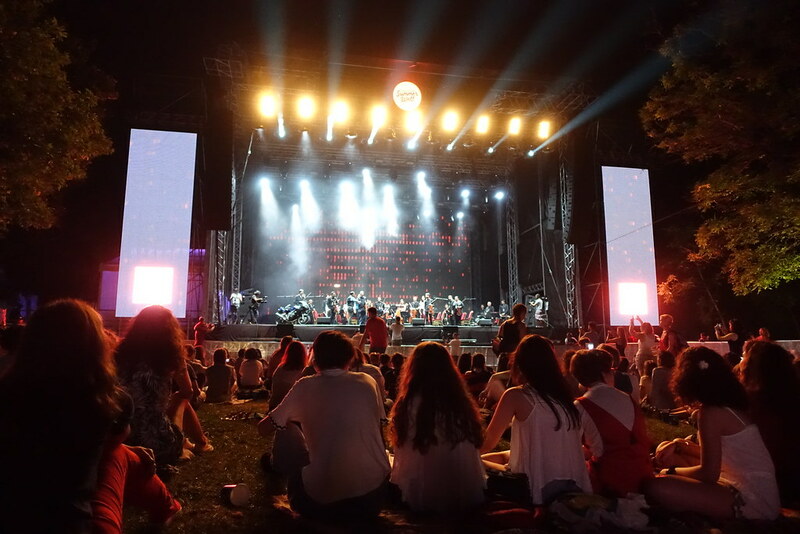 Posted in Eastern Europe, European cities, Reviews, Romania, TravelTagged 2017, Domeniul Stirbey, Metronomy, music festival, night picnic, Summer WellBookmark the permalink. It sounds like it was so fun and amazing!!! Lol at boring Interpol. 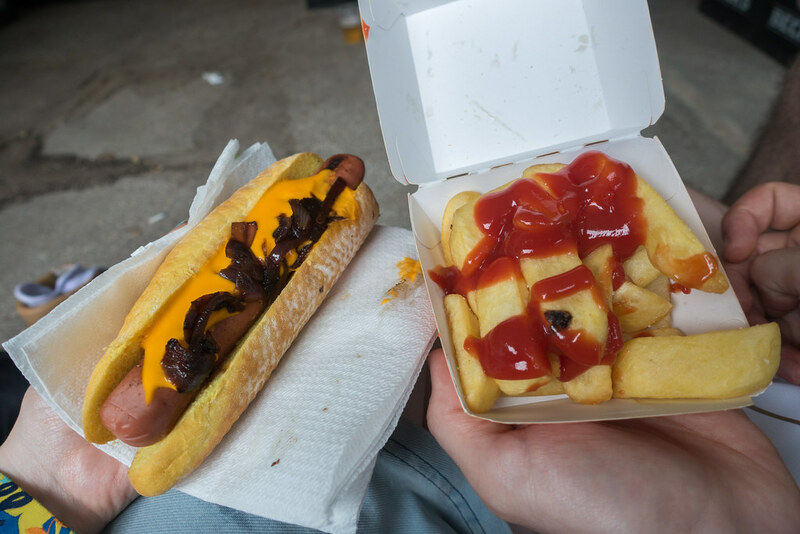 Never resist photographing food in front of views. I know the Tomb Raider level you are referring to!! 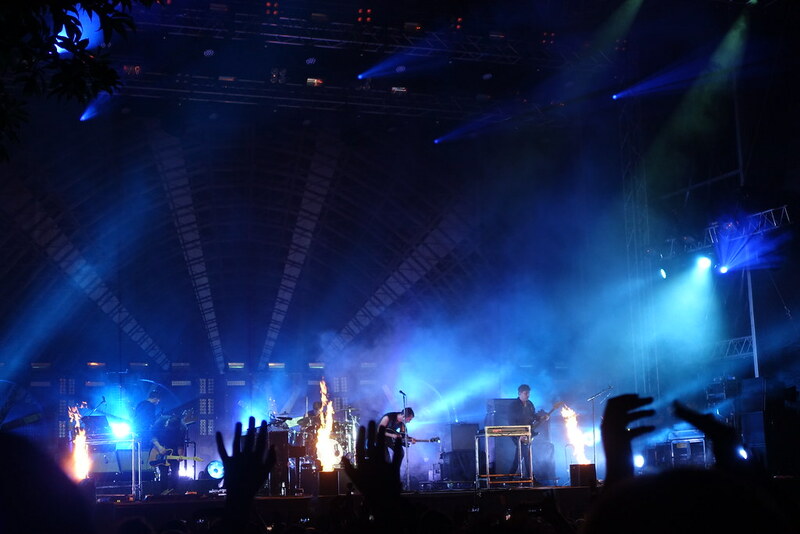 Editors was a nice surprise at Summer Well. I loved them ever since Papillon and they also seem to love it here because it was not their first concert in Romania, as far as I know. Glad you had such a nice experience! Thank you, I’m glad you enjoyed it too! Had you been to Summer Well in previous years as well? Yes, it was right up my street! !